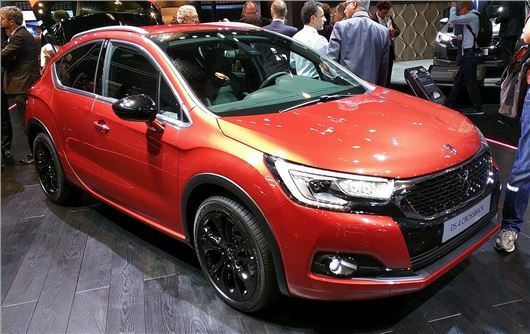 Citroen’s premium DS brand has unveiled the DS4 Crossback along with the updated DS4 at the Frankfurt Motor Show. Prices will start at £20,000 when the facelift DS4 goes on sale in November. The Crossback is a more rugged version of the DS4 but doesn't have four-wheel drive - think Vauxhall Adam Rocks or Rover Streetwise. However it does sit 30mm higher with larger wheels while the rugged look is completed by big wheel arches, chunky bumpers and roof bars. Alongside the launch of the Crossback, DS has also revised the DS4 line-up. It gets a new front end, with a horizontal grille and large DS badge that's flanked by chrome 'wings'. The headlights - which now include LED signatures - are sleeker and stretched, while Citroen says it has redefined the car's shoulder lines to give it an executive appeal. The DS4 comes with a choice of six engines - three turbocharged petrols and three diesels - while the Crossback is limited to a 130PS petrol or a 120PS diesel. The hatchback range starts with the 130PS petrol, linked to a six-speed manual, and returns up to 55.4mpg with 119g/km of CO2 on 17-inch wheels. The more powerful 165PS petrol returns 47.9mpg with and 138g/km of CO2 and is linked to a six-speed torque-converter automatic, while the most powerful petrol is the 210PS unit linked to a six-speed manual that returns 47.9mpg. Power outputs for the three diesels range from 120PS to 180PS while economy spans from 72.4mpg to 64.2mpg. All of the diesels use a six-speed manual as standard, but none dip below 100g/km of CO2, with the cleanest being the 120PS unit, which emits 102g/km. Inside the DS4 gets improved materials, with door panels finished in Nappa leather and semi-aniline leather upholstery with a ‘watch strap’ design. A new seven-inch colour touchscreen is also standard, while the options list includes a reversing camera, massage seats and CarPlay for mobile phone connectivity.